This project, created by the German artist Kurt Laurenz Theinert and situated in the square in front of the Vžigalica gallery, is based on challenging and overcoming of the established perception of colours. It creates a visual experience born with the artist’s use of colours and artificial light. 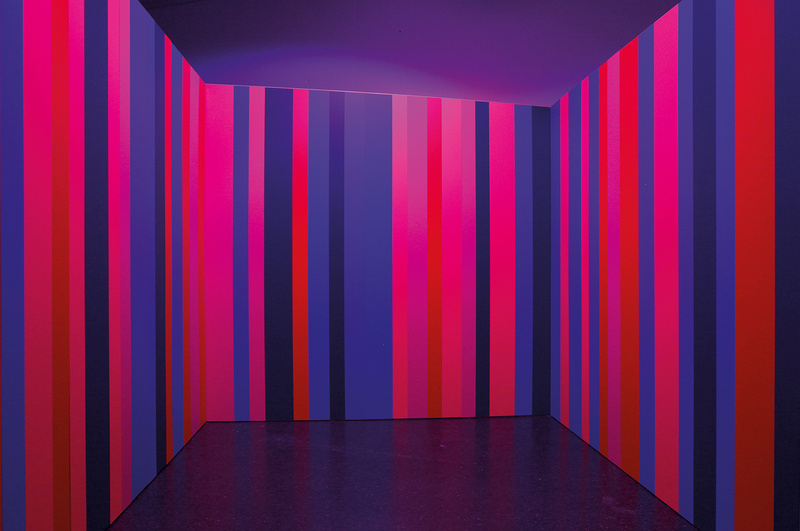 The viewer, immersed in the colourful scenery, witnesses an optical illusion, created with the use of different intensity of primary colours and with the rhythm of their changing intensities, which is then felt as a pulsating movement of narrow coloured strips alongside walls of the scene. This lightful ambient offers an ever-evasive experience and in this way shakes up our established way of viewing our environments. Kurt Laurenz Theinert (Hannover, 1963) is a multimedia artist who focuses on abstract reductive aesthetics which, in his quest for dematerialisation, brought him from classical photography into the exploration of light. He finished his studies at the State Academy of Fine Arts in Stuttgart and at the University of Leicester. He’s received the MuVI3 award for new media arts in 2011 and 2 years later the Visual Artists Association of Baden-Württemberg award as well. He lives and works in Stuttgart.